The amount of data around us is growing and we are facing significant problems to find stuff on the web and in the real life. The adoption of search technologies has grown for the last decade. Google made it very easy for many people to think about search and use about any problem as a “search problem”. At the same time, search in the enterprise and manufacturing companies is a different problem. In many use cases, web search requires to bring top results. In the enterprise, the diversity of data is higher and the relevance criteria is different – what is the right result for you is different for somebody else. Business model for enterprise search is also different. While web search is relying heavily on advertising, I haven’t seen enterprise search doing similar things. While CAD and PLM vendors can see a demand for reliable search features, overall solution for a company might require lots of specific data source integration, tuning and running cost. I’ve been following search technology and implementation trends for the last decade in the enterprise domain and, specifically, engineering and manufacturing. What is a most painful problem CAD companies are trying to solve using various search technologies? It seems to me search for Parts is a type of solution that vendors consider as a priority to solve. Solidsmack article Autodesk announces design graph punches shape search solar plexus speaks about evolution of search related development made by Autodesk for the last four years. How do they find my 3D data? Simply put, you enter a search term and filter the results down from there. Design Graph searches primarily by shape and allows you whittle results down by category. It will search through all of the 3D data you have… as long as it resides on the A360 cloud-based design/collaboration platform. But here’s the difference. The technology is driven by shape search, but is not the sole criteria. After the shape is captured – the features are captured. After the features are captured – the morphology is captured. After the morphology is captured – the patterns of all the bits are deconstructed. And it’s doing this for all the data, in every account on A360, learning from it and applying it to the whole. The following video can give you an idea of how it works. Another solution – OnePart from Dassault Systemes is a result of morphing search technology developed by Exalead together with 3DEXPERIENCE. It allows to reduce amount of time needed to search for part. It prevents engineers from creating duplicated parts. Navigate to OnePart website here. 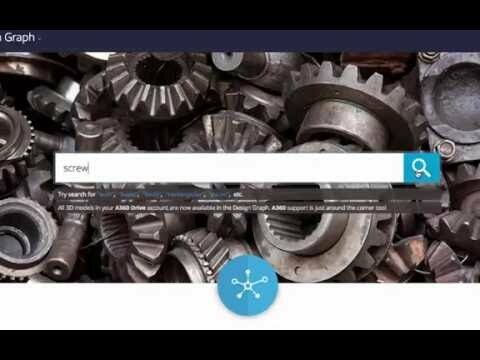 The EXALEAD OnePart integrated search experience is uniquely capable of adding similarity, metadata, and semantic-linked documents and related information to shape search capabilities. Engineers, managers, technicians, and procurement specialists can quickly and easily find and reuse existing 2D/3D files of parts, product designs and other related information located anywhere inside the organization, even beyond obvious PDM and PLM repositories. The result: optimized reuse of parts, designs and related documentation, thus accelerating product development and delivery and decreasing design, material, manufacturing, and storage costs. 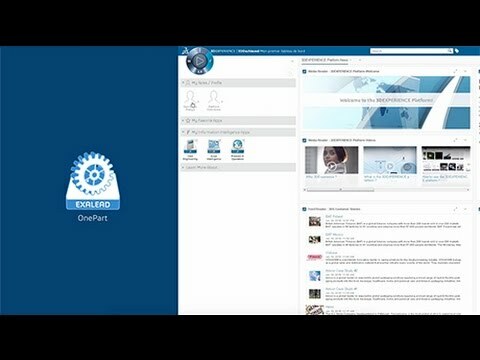 I found the following video presenting OnePart inside of 3DExperience. CADENAS ( http://www.cadenas.de/en ) offers interesting solutions for Part management and some OEMs like Daimler, ABB, Airbus and Kuka use a (customized) solution of CADENAS! There exists also a possibility for eCl@ss Integration. Jupp, Thanks for sharing links! I think, these are multiple “aspects” of Part management. Search and analytics is one of them. It won’t replace part management, but it certainly helps. Thanks Oleg and Thorsten for your comments. As you mentioned, part management has multiple aspects. I meant also a solution including a 3D Geo-Search and Analytic. Geo-Search and analytic functionalities have been also used to find similar parts across different products in a company and consequently clean up the part catalogs. http://www.engineering.com/Author/ID/162286/DickBourke. What are SBAs? How do they work? Who are the vendors? And, more. Thanks for bringing up again this underutilized opportunity. I’ve been writing/consulting on this topic for many years, explaining the value of parts search and reuse to accelerate design time, improve quality, optimize inventory, enhance cost analysis, run supplier rationalization campaigns, and reduce ECO. The benefits are undisputed, yet many engineering organizations show little interest. Only a couple of weeks ago I spoke with a software company considering creating a product offering for this market. They did their own market research and reached the same conclusion. If the benefits are so obvious, how come manufacturing companies are not seeing it? In my opinion this is yet another facet of the difficulties many organizations have making effective multidisciplinary decisions. In PLM terms, it’s a myopic view that prevents these organizations from seeing the downstream value of early-stage decisions. Having said that, PLM vendors do a mediocre job in explaining the value. They focus on the algorithmic side of shape-based indexing and searching and do not call enough attention to PLM-oriented benefits. Thorsten, search is not a replacement for part management. My point is that part management is an opportunity for search and analytic tech. Joe, thanks for sharing your insight. The situation with search reminds me tablet computers back 10 years ago. It was already there, but not good enough and th benefits were not obvious. I think there are more benefit with organizing your data in an appropriated way than searching for them: you do not need to search if you know where it is (or should be). Think for “old fashion” library or grocery shop. OK, it is more static, or need bigger effort to create and maintain the data. The main benefit in organizing the data is that you can walk and search for inspiration if you have no precise idea instead or searching “blindly”. Nevertheless, I’m quite amazed by searches that used the geometry information, looking for quite similar parts. I like the notion of “searching for inspiration” (or, by the same token, for efficiencies, reuse, alternate supplier, etc.). Even if an organization somehow manages this (which I doubt), it still needs to consider part information coming from outside its walls: suppliers, customers, partners, COTs, etc. In a way, I see a potential for even greater fragmentation if each enterprise has its own taxonomy and data dictionary as good as they may be. this management is the purpose of archiving data, what should be separated from storing data. The last years (decades), the cost of storing digital data has decreased dramatically, and lot of people/companies first do not see the need for managing the archiving of data, relying on storing all possible data (just in case). It so “easy” to search for the information afterwards. We all own more and more mess as the power of search increase. Can I return the question: do you have examples when searching for parts for reuse do make sense? I only see looking for screws (exactly like your video). As a student I thought there were lot of reuse of parts. After years of dealing this customers (mainly in automobile and aerospace industries), I changed my mind. Because of certifications need (a part is certified for function in a plane), iterative improvement processes, cost optimization, etc. You rarely reuse parts, except standards. In fact, if you want to reuse some system/module; you know exactly how to find it in the corresponding project. In Ship building, I would say it even worst. For standard parts, you generally manage them via Classification (taxonomy) modules from your PDM system, or simply by organizing efficiently a part of your filesystem. I’ve seen good example when provided search solution to engineering service companies doing multiple projects for different customers. When you have many projects and you want to re-use part of the project to modify it and sell to another customer, search can be very helpful. Another example is searching for reference information you need for your project and you know it is somewhere in your organization. We can discuss more – reach me out oleg at beyondplm dot com. I’d love to give you more examples. The notion of parts reuse goes far beyond the simple definition of finding a compatible replacement part, such as your example of a screw (although I am always amazed by how many duplicate parts from different suppliers are found in companies’ inventories). When you reuse a part you also reuse its associated methods and processes: tooling, work instructions, etc. Moreover, you reuse insight that is otherwise available only months or years later: supplier quality, failure rate, warranty claims, and so forth. Said differently – design reuse is knowledge reuse. This is an enormous potential companies leave untapped and PLM vendors don’t do a good enough job selling. Oleg – knowledge reuse through shape search and mining experience is exactly what Machine Research was started up to do and provide. The company has definitely strayed from our initial focus since Richard and I left, but their intent remains somewhat similar. Chris, what initial focus do you mean?